Cerdedo is one of those towns in the middle of nowhere and we encountered it on a long and scenic drive to and through Ourense. 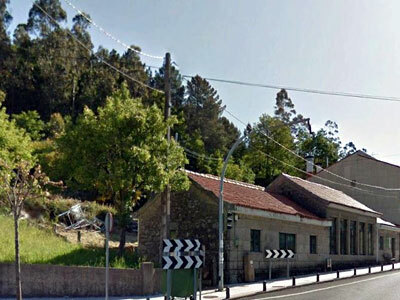 You reach Cerdedo by heading inland on the N541 from Pontevedra to Ourense. It is about 60 km from Pontevedra, but on a single carriageway road. The scenery on route to Cerdedo is often spectacular and most of the journey is travelled at an altitude of several hundred metres above sea level. This part of Galicia mixes forests and meadow, but it is always green. Right, driving along the N541 as you pass through Cerdedo. The town itself sprawls either side of the highway for three or four hundred metres with most of the urbanised area to the north. 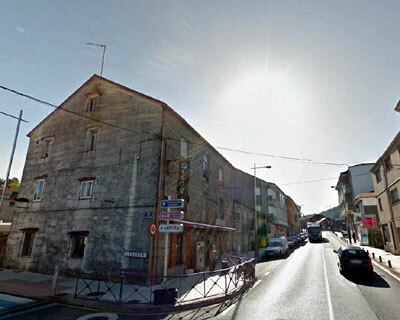 The main reason for its mention here is that you may, as we did, use this little town as a stop off point during a trip to Ourense and, with its four or five bars and a small supermarket, it makes a valuable interruption for provisions or a coffee. We took a brief look around Cerdedo and it has a church plus numerous new, but tastefully recreated examples of small traditional Galician structures. 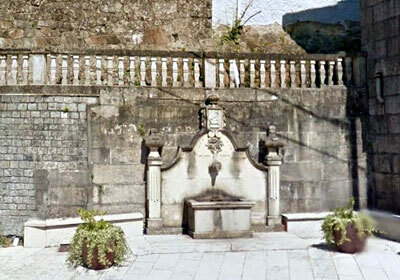 These included a fountain (which you can see to the left), a cruceiro and an old style washing stall. All were newly constructed and primarily ornamental, but done sympathetically and in keeping with the town and region. Shortly after leaving Cerdedo we passed a sign stating that we were now at no less than 600 metres above sea level. Amazingly we were still climbing. Right, a typical view of the buildings in the town. This is at a juncture where you can drive into the main built up area, or bypass the town via continuing on the N541.